The Perth Cup is a Group 2 staying showdown contested over the mile and a half at Ascot Racecourse in Western Australia each January during the Perth Summer Racing Carnival. The 2400m quality handicap clash offers a lucrative $500,000 in total prize money and Perth Cup Day is one of the biggest summer race meetings anywhere in Australia. Traditionally held on New Year’s Day, there were two editions of the 2016 Perth Cup one run in January and the other on New Year’s Eve in December. That meant there was no official 2017 Perth Cup, with the next edition run on New Year’s Day in 2018. Perth Cup Day is the final race meeting of the annual Festival of Perth Racing and the day’s feature has run since 1887. Previously contested over the two miles (3200m) like the iconic Melbourne Cup, in 2009 the Perth Cup distance was shortened to the current 2400m and has been attracting top-class stayers since. The traditional lead-up race is the Group 2 CB Cox Stakes (2100m), now known as the Ted Van Heemst Stakes, run at Ascot in December and the last horse to complete the CB Cox Stakes – Perth Cup double was Delicacy (December 2015 & January 2016). The Group 1 Railway Stakes (1800m) also serves as a nice Perth Cup lead-up race. The latest edition of the Perth Cup ran on New Year’s Day Saturday January 5, 2019 . The official Perth Cup 2019 Results & Finishing Order will be available below once the 2400m summer staying classic is run and won on New Year’s Day, Saturday January 5, 2019 . Perth Cup odds open weeks in advance of the race with bookmakers around the country offering futures prices and all-in markets on the event. Local stayers with proven form at Ascot and over the 2400m dominate Perth Cup betting each summer, as do Grant Williams-trained runners with the right lead-up form as he has trained multiple winners of the classic in recent years. The best out of the CB Cox Stakes earlier in the festival often feature high up the markets and in-form mares make a nice bet with the girls boasting a top recent record thanks to wins by the likes of Delicacy (January 2016), Real Love (2015) and Talent Show (2013). The season’s latest Perth Cup 2019 betting odds will be provided below as soon as open so stay tuned for the top summer racing markets online. The Perth Cup field attracts a line-up of primarily local stayers that do battle over the 2400m. Some interstate raiders have contested recent editions of the race including the December 2016 win by the Darren Weir-trained Star Exhibit, but more often than not the Perth Cup trophy stays at home in WA. 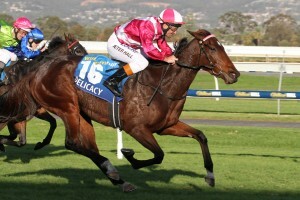 Delicacy (pictured in Adelaide) is one of the shortest-priced recent Perth Cup winners having won at $2.40 in January of 2016. Photo: Jenny Barnes. The bulk of the Perth Cup field come via a run in the weight-for-age CB Cox Stakes at the same track over 300m shorter the month before and the CB Cox Stakes – Perth Cup is a popular betting double. Perth Cup nominations close a month prior to the race in the first week of December before the final field of acceptances and barrier draw is released the week of the race. The official Perth Cup 2019 Final Field & Barrier Draw will be released by Perth Racing the week before the race is run and won on New Year’s Day, so stay tuned to see what summer stayers make the starting line-up. The official Perth Cup 2019 Nominations are taken around four weeks out from Perth Cup Day and attract the top summer stayers getting about in WA for the season. Perth Cup betting tips usually feature proven stayers at the track and distance from local stables and graduates out of the CB Cox Stakes earlier during the Perth Summer Carnival of Racing. Grant Williams-trained runners have a very good recent Perth Cup record so a good tip is to get behind his in-form stayers of the current season, especially the mares. Our Ladbrokes’ insider Perth Cup 2019 Tips and summer betting guide on the Group 2 New Year’s Day race will be detailed below the week of the event so stay tuned for the stayers to back and sack. The Perth Cup form guide provides punters with all the must-know information on the race before placing bets like saddlecloth numbers, jockeys, trainers, barriers and the weights each runner in the field is to carry. Wide barriers can be overcome in the Perth Cup, as can big weights proven most recently by Delicacy who carried 59kg to victory in the January edition in 2016. She was the second mare in as many years to beat home the boys in the Perth Cup results, so looking for in-form female stayers on the Perth Cup form guide can prove profitable. A link to a comprehensive Perth Cup 2019 Form Guide will be provided for punters below the week of the race. Perth Cup results have been dominated over the past decade by local stayers coming out of a run in the CB Cox Stakes – a double recently achieved by the likes of Delicacy (January 2016), Lords Ransom (2010) and Cats Fun (2008). Favourites have a strong Perth Cup record, but upsets are also not uncommon including in 2013 when Talent Show saluted at $31 on the back of a CB Cox Stakes fourth – the same lead-up placing as the follow year’s Perth Cup winner Black Tycoon (2014).